Well, I'm not a very lay back Mum even though I play badminton with the boy frequently I do not like to do any sports, not even running (except for running for the bus occasionally), I was telling a girl friend just the other day "I don't like to run, if I run all my fats in my body will protest." However, that does not stop me from letting the boy has any chance to enjoy the outdoor and sports so I am signing him up for the Cold Storage Kids Run 2015. 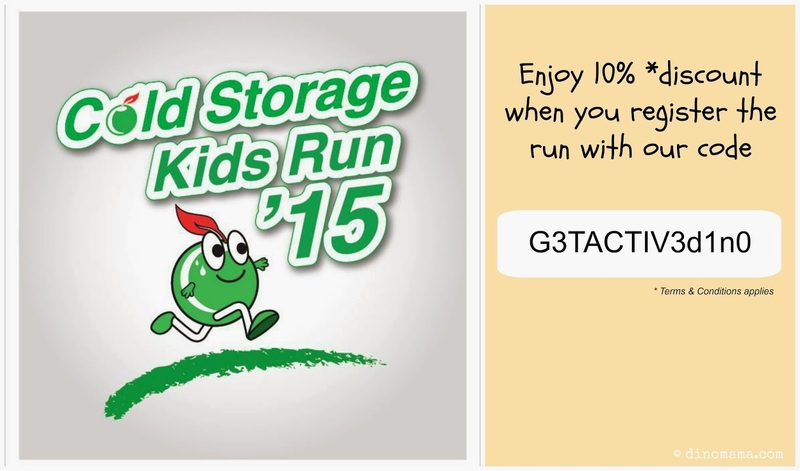 Cold Storage Kids Run, the annual running event for kids that aims to encourage the young ones to start early with healthy lifestyle and eating, is back for its 8th consecutive year on 17 May 2015! With a better route design, you can look forward to an even smoother race experience. Organized by Enterprise Sports Group (ESG) and title sponsored by Cold Storage, this event has the distinction of being Asia’s first kids-focused running event and one of the best sporting events that caters to the entire family, and won awards such as the Best Retail Event Award of the Year 2009 by the Retailers Association of Singapore. Kids from six months to 12 years old can also participate in 13 categories, consisting of competitive (Sprint) and non-competitive (Family Fun) races ranging from 800m to 1.6km. This year’s Cold Storage Kids Run also features the 3Gen Family Fun Run category to promote inter-generation fitness and bonding. Wow! Quick, grab grandma and grandpa to join in the fun, the healthy way! Don't worry if Ah Gong and Ah Ma cannot run as this is a non-competitive category, the of you; kid (aged 4 to 12 years old), Mum/Dad and Ah Gong/Ah Ma can choose to walk or run the whole 800m. To further encourage families to stay active, fun fitness classes will be held before the race, Slots are running low for fun fitness classes. Hurry click HERE to register now!!! So lets all Get Active, Get Healthy with Cold Storage Kids Run!!! Mark down this date and join in the run! Activities include a sports-themed carnival, running clinics, sports introductory classes and more. And since this is the first time the DinoFamily enters into such run, we must celebrate it! Here's a discount code *terms & conditions applies* for all my wonderful readers! 1. For registration on or before 9th April 2015, enjoy an additional 10% off on top of the early bird rates. 2. For registration on or after 10th Apri 2015, enjoy 10% discount off the original ticket prices. Hurry, you have 3 more days to use this discount code! We hope to see you there! Disclaimer : We are in no way affiliated to the staffs and management of Cold Storage or Enterprise Sports Group. We were invited to participate in the Cold Storage Kids Run 2015. No other form of compensation was received.